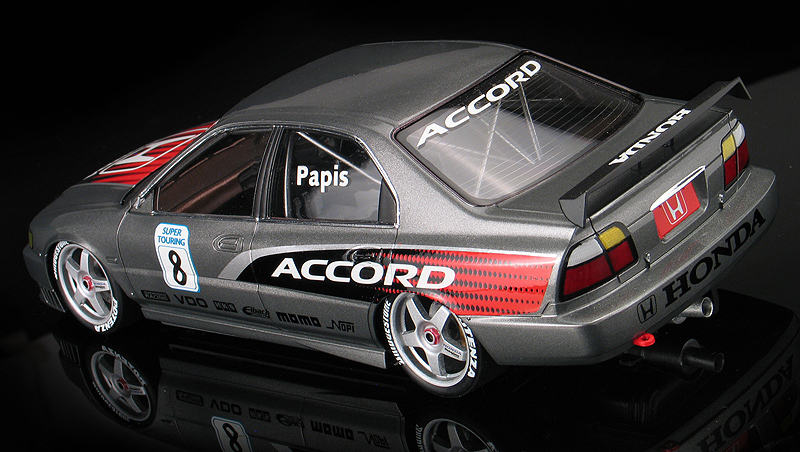 I bought a Tamiya PIAA Honda Accord JTCC kit because I thought it was a cool looking car. Having never seen a Japanese touring car race, it sat around while I decided what to do with it. Later on, I built a replica of the Dodge Stratus that Chrysler Corporation ran in the short-lived North American Touring car series. That racing series died mostly because of the lack of factory sponsored cars. 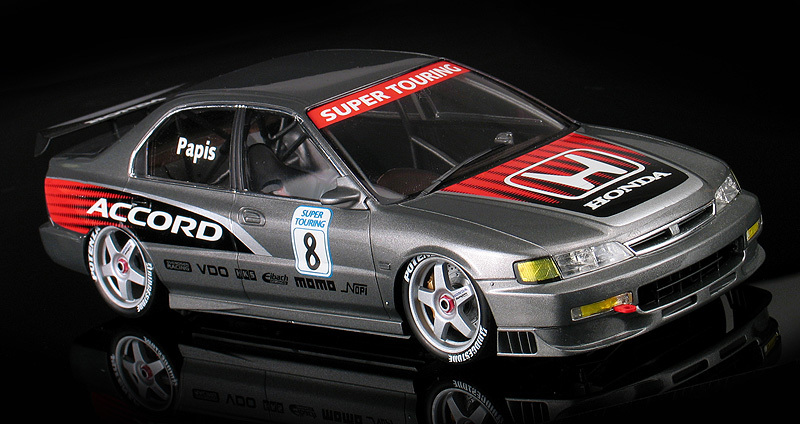 In that series there where also some Honda Accords brought over from Japan and run by privateer teams. At first, I considered building a replica of one of those Honda Accords, but I thought most of them looked pretty lack luster. So, I decided to build a fantasy version of what I thought a factory sponsored Honda Accord NATCC might look like. The graphics are completely of my own design. First, I created the artwork on my computer. Then the files were sent out to a service bureau and they created custom made dry-transfers for me. They graphics were applied over a very conservative Honda-like metallic gray. Recently, I have been using PPG Deltron automotive urethane basecoats with their Concept 2000 clear coat and I have to say that the results are stunning! Other than the addition of some aftermarket carbon fiber decals used in the interior, the rest of the kit is built right out of the box.